Such systems have been tested with varying degrees of success since the 1990s. Researchers from the University of Central Florida have now implemented a novel simulation approach to evaluate their efficiency. The study can was published in July 2015 in the open-access journal Nature Conservation. 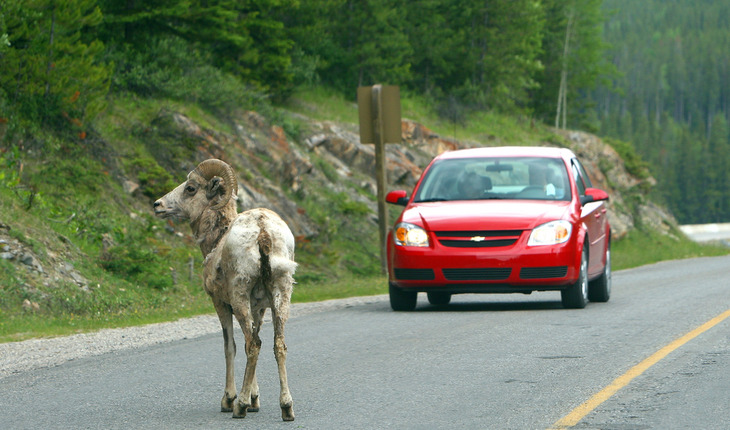 A release from the publishers notes that the researchers stress that road accidents involving wild animals are posing a real threat to their populations. In addition, the researchers tested whether simple, picture-based warning signs yielded better results than text-based ones. Using a simulator had additional benefits: “We were able to study responses that would be extremely difficult to measure using field observations, such as the precise moment a subject started braking,” said Dr. Daniel Smith, a Principal Investigator on the study. The simulated road was modeled after Highway 41 in Big Cypress National Park, Florida, where a RADS was installed in 2012 to reduce road-kill of the endangered Florida panther. “Road-kill is the largest controllable source of mortality for the Florida panther, and has been increasing virtually every year,” said the study’s other PI, Dr. Reed Noss. “As more is learned about Roadside Animal Detection Systems, it is possible that we may start to see more of them at roadkill hotspots like the one in Big Cypress, hopefully making roads safer not just for panthers and other wildlife, but for humans as well,” he added.